160pp full colour throughout. In this book, Ruth Johnston tells some of the inspiring and sad stories which relate to the monuments. From the 3,500 monuments in the Necropolis she has selected and photographed over 150 of them erected to the memory of people from all walks of life some of whom were major players in the formation of Glasgow during its time as the ‘Second City of the Empire.’ Some monuments are included purely from a personal view that they are wonderful pieces of art in their own right. She has included the names of the architects and sculptors who were inspired to create some of the beautiful monuments in this garden cemetery. 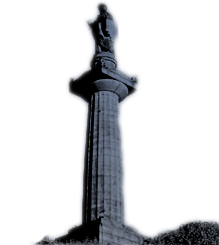 They include Alexander ‘Greek’ Thomson, J T Rochead, David Hamilton, John Bryce, Charles Wilson and Charles Rennie Mackintosh, who lived in a tenement in Dennistoun, on the eastern boundary of the Necropolis. One of his first commissions was to design a monument in the Necropolis. I have acquired your splendid volume on Glasgow Necropolis: very beautiful AND useful. Congratulations! By Ruth Johnston (Chair of The Friends of Glasgow Necropolis). 24pp full colour throughout This 24pp pocket size, trail guide makes a visit to this wonderful garden cemetery a really pleasurable experience. The author is a life long enthusiast and there are descriptions of 60 monuments found easily over a two hour tour, making sure you don’t miss the most famous ones designed by Alexander ‘Greek’ Thomson, Charles Rennie Mackintosh, JT Rochead, Charles Wilson amongst others.